The Yankee Stadium is a stadium located in the Bronx in New York City, New York. It serves as the home ballpark for the New York Yankees. This new stadium was opened on April 2, 2009. 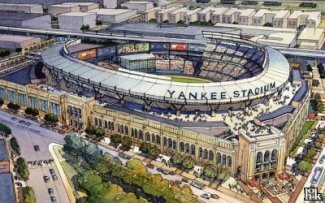 The first game at the new Yankees Stadium was a preseason exhibition game against the Chicago Cubs played on April 3, 2009, which the Yankees won 7-4. The first regular season game was played on April 16, a 10-2 Yankee loss to the Cleveland Indians. Let's cheer on for the New York Yankees this season and come join them for their home games. Please inquire within their web page for other special events beside a baseball game.